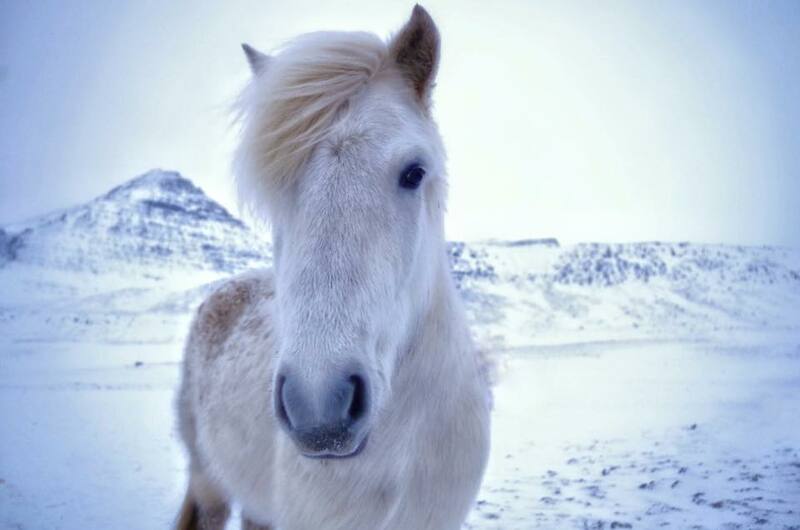 If a friend asks me about my trip to Iceland, I tell them about the people. My multi-continental travel buddy who agreed to meet me in Iceland for Christmas. Our new bestie from Couchsurfing. The board games and matchmaking and bracing ourselves against the wind, and the board games again. The long winter's nights give you plenty of time indoors. But if a friend who's going to Iceland asks me about my trip to Iceland, I tell them so much more about what I loved of the country itself. Now that I've seen them, I can be honest. 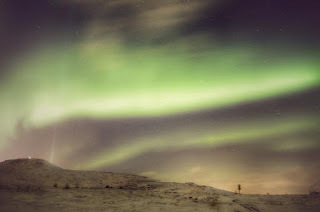 The Northern Lights were the reason I wanted to go to Iceland in the winter. And they were totally totally worth it. But between solar activity and cloud cover, it is highly likely to miss them. So it was important to me to focus on the other reasons to go, and to make sure I wasn't setting myself up for a very expensive disappointment. Once your travel dates are set, there are three remaining guidelines that optimize your chances of seeing the Northern Lights. First, get away from light pollution. If you're staying in Reykjavik, you can choose to join a tour bus that will track that night's best locations for cloud openings and solar activity. Or you can rent a car, download an app, and do this yourself. Second, give yourself enough time. I was there about 9 days, which is still no guarantee of course, but every extra night increases your chances. Third, start trying to see them your first night. If you book with a Northern Lights tour bus and the trip is canceled, they'll refund your money. If the trip goes but you don't see the lights, they'll let you repeat the trip until you do. 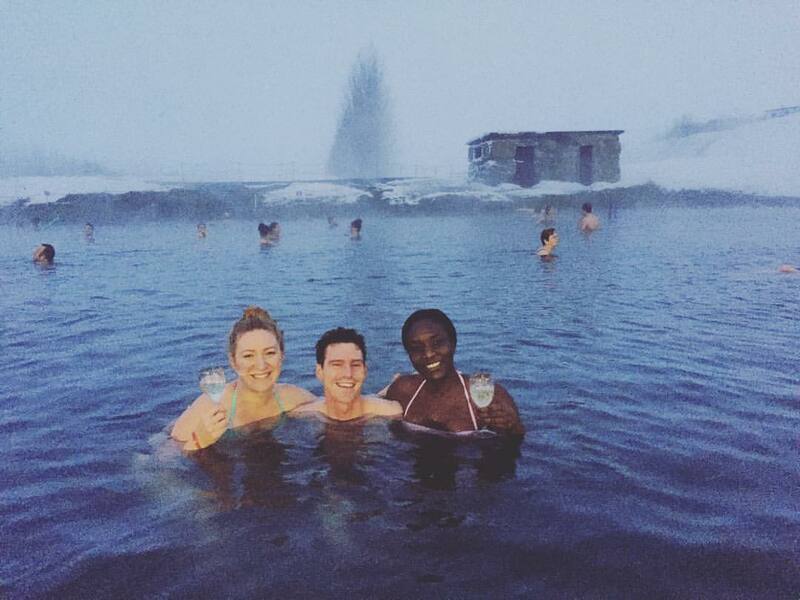 The more days you have left in Iceland to take advantage of these policies, the higher your chances. Obviously the same idea applies if you're driving yourself. You won't need much advice from me -- the route is basically the same regardless of which tour company you choose, or if you drive it yourself. But my two recommendations: Sneak in a side trip to the Secret Lagoon. It's very much on the way, but not all tour companies take advantage of that! Also, if possible, try to do this on a clear day. 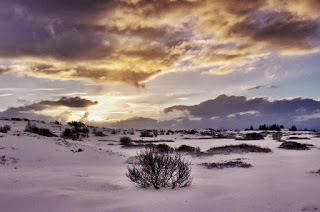 The Secret Lagoon and Geysir are just fine in the snow, but sites like the Gullfoss waterfall are best unobstructed. This one involves a slightly dicier drive from Reykjavik. While we considered renting a car for some of our sightseeing, I was more than happy to leave this one to the professionals. On the other hand, the iconic World War 2 beachfront plane wreck is a 30 minute walk from the main road (in Vik), and tours will not take you there. The tour involves a stop at some beautiful waterfalls, which may be worth another visit in better weather. An advantage to going in the winter is that Seljalandsfoss Waterfall is lit up beautifully at night, and wintertime affords plenty of hours of night. A disadvantage: when the weather is bad, you no longer have the incredible opportunity to walk behind the falls themselves. My friend and I agreed that this may only be worth a visit in good weather. Driving there takes a while, and you're constantly racing against the daylight. The sites are beautiful, but difficult to fully appreciate in bad weather. The road to the black sand beach is itself often snowed out. Church Mountain and its small nearby waterfalls make for an iconic view, of course. I wouldn't say we regret taking this trip. Let's just say if we worked for the tour company, we'd push this trip much harder in the summer than we would in the winter. 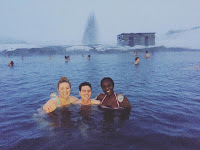 Reykjavik pools. There are a number of pools within the city that may not be quite as legendary as the Blue Lagoon, but are only a short walk away from the city center, and cost about 1/8 the price. Glacier trekking. The Solheimajokull glacier was stunning. I'm not always blown away by natural beauty, but this one... wow. 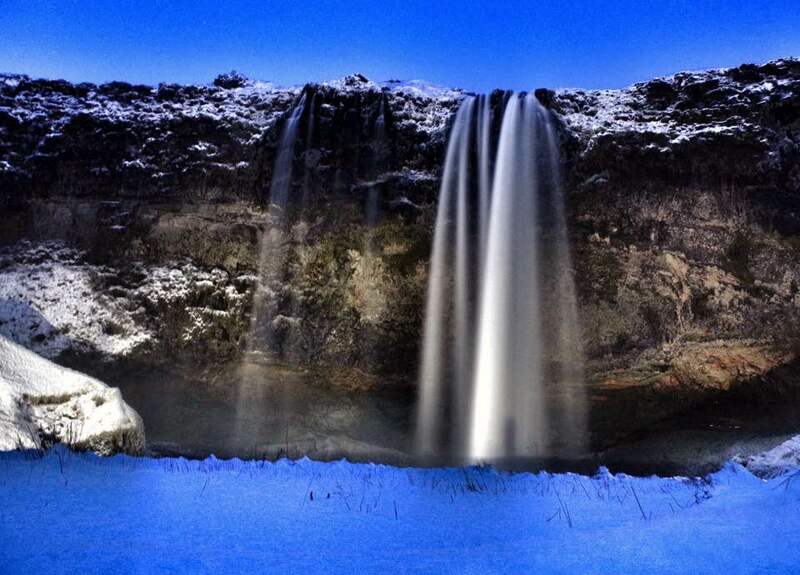 The lava leaves these black streaks in the white ice, and the combined picture is just breathtaking. We did not trek on the glacier itself, and we did notice the treks being pretty crowded, especially at the outlet. But we heard nothing but good things from those who did it. Glacier lagoon. If you have the opportunity to go even further east along the south coast, you'll reach a beautiful lake with floating glaciers. Apparently just gorgeous. 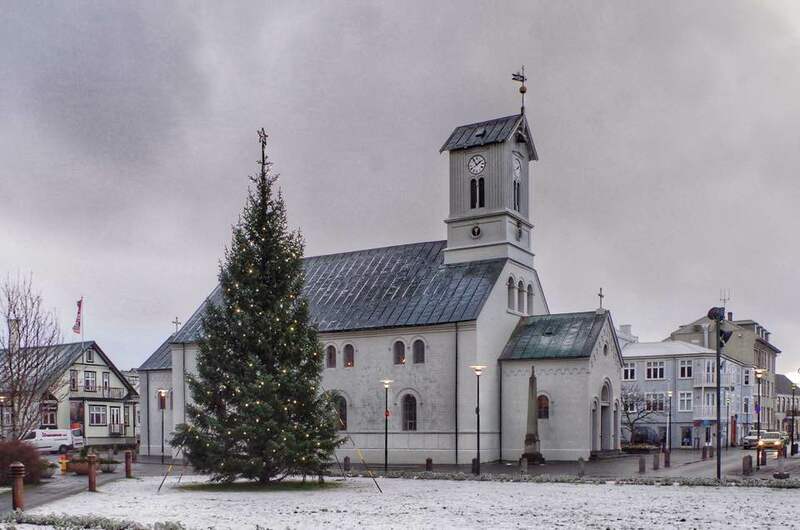 Akureyri. Two-thirds of Iceland's population lives in and around Reykjavik. Just so you have some context when I say Akureyri is Iceland's second-biggest city. It's not that big. It's supposed to be beautiful and well worth a visit. And small enough that the Northern Lights are often visible without as much concern of light pollution! I don't have plans to go back to Iceland any time soon, but if I did it wouldn't be in winter. Don't get me wrong, I'm so glad I did it, and so glad I did it in winter! But if there is a next time, it would be for the purpose of seeing things in, quite literally, a whole different light. 330 days. 26 countries. 336 seconds. Ten days in Vietnam is not enough time. That's just a fact. But I had three weeks free, and I couldn't let go of the idea of seeing either the Philippines or Vietnam. So I made the decision that made every other backpacker think I was a weirdo, but made me really happy: I visited both. Do I wish I'd spent more time in each? Of course I do. But do I wish I'd skipped either for the sake of seeing more of the other? Not a bit. But there's still the issue of how to spend those precious 10 days in Vietnam. The stunning natural beauty of the Phong Nha Caves? The peacefulness of Dalat? The picturesque rice fields of Sapa? The hustle and bustle of Hanoi or Saigon? Some combination of the above? In the end, I decided to aim right for the center. There's no one right answer, of course, but it did teach me a lot of lessons about what's right for me.